UTS München was founded in 1999 by a German engineer by the name of Nicolaus Spinner. He decided to create watch cases with the highest precision for diving purposes. The watch cases are being designed and manufactured in-house in the workshop in Holzkirchen, a small village below Munich in Germany. Our photographer Bert Buijsrogge was able to get his hands on a UTS Diver 3000, a watch that has been created by Spinner in Germany approximately 8 years ago and still going strong in the UTS München collection. We have a 2008 model that was made available through a local watch dealer here in The Netherlands, Local-Time. Normally focused on Rolex watches, but the owner of Local-Time thought that this UTS Diver 3000 watch was interesting enough to add to his stock of pre-owned watches. 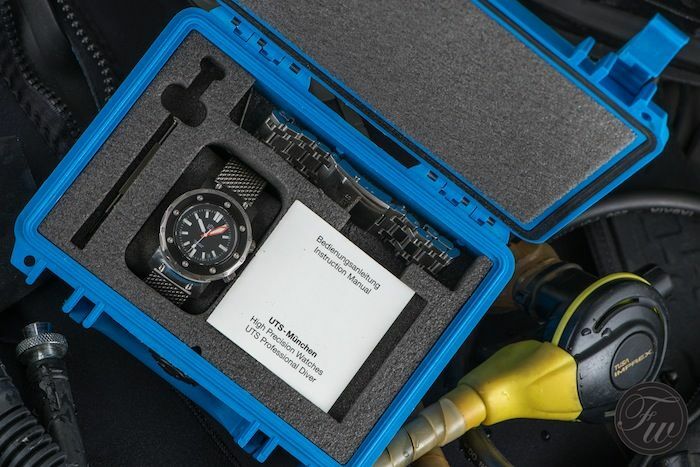 The UTS Diver 3000 is being delivered in a nice suitcase that holds the watch, its instruction manual (both in German and English), an extra bracelet (we love the mesh bracelet) and a screwdriver so you’ll be able to swap the bracelets as you wish. As we’ve written above, the owner of UTS Munich is an engineer by heart, so the focus is on functionality and the quality of the case. Even though the movement inside is the well known and respected ETA2822-2 (Top Grade version), the attention goes out to the well crafted watch case. 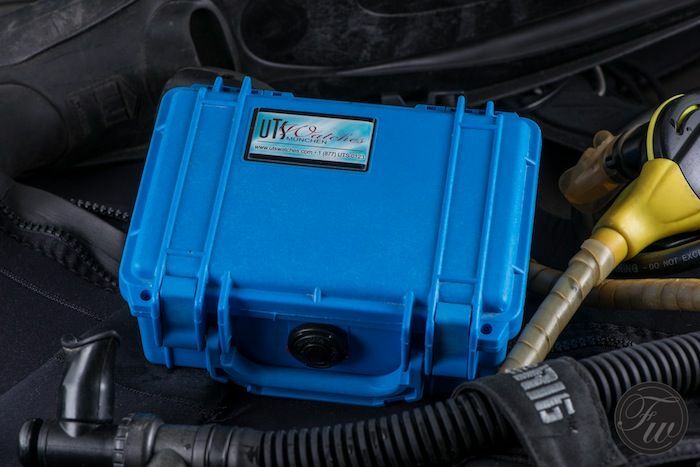 It needs to as well, as this watch is water (or pressure) resistant up to 300 bar (which equals 3000 meters). The large crown is of course screw-down and the sapphire crystal is 5mm thick! Most watches with this kind of specifications have one thing in common with fish that are located very deep in the ocean: They are plain ugly. However, we’ve to admit that although the watch has a very industrial and ‘German’ appearance, it is definitely a watch that you can wear when not diving and without being embarrassed about it. The hands and dial have SuperLuminova applied for the best visibility in the dark. The large orange minute hand is something we’ve seen on other diving watches as well, but we really like this Sword-hand style. As you probably guess already, the second crown at 2 o’clock is to operate or lock the diving bezel. 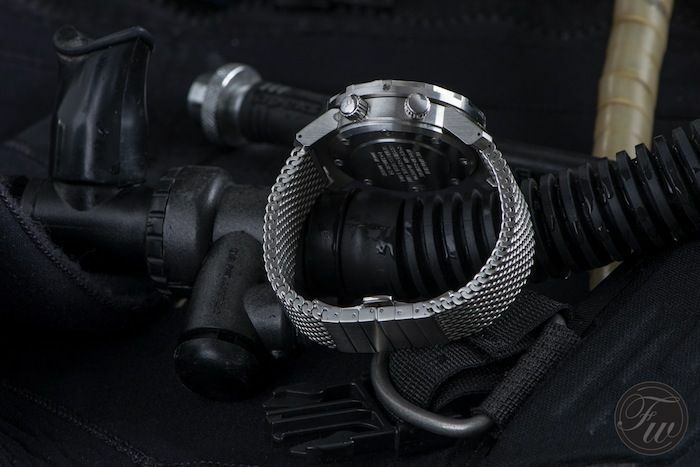 Normally, a new UTS Diver 3000 watch retails for 3500 Euro (and the extra Mesh bracelet is another 500 euro). 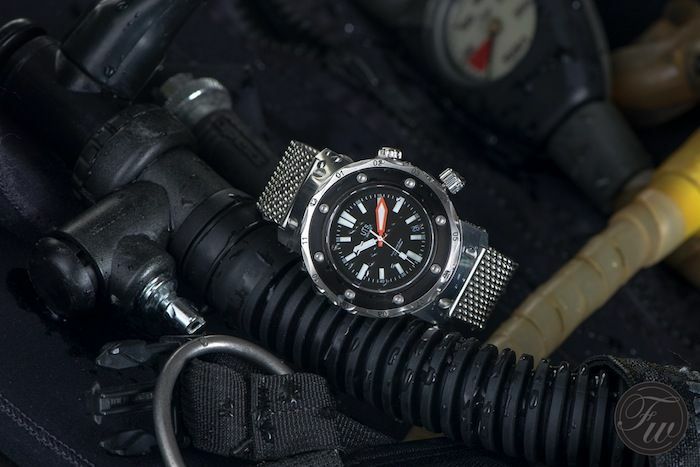 We think that the professional diver with love for mechanical watches won’t be scared off with regards to that retail price. However, the people who wear diving watches for being a lifestyle product might think that this is a hefty price tag. 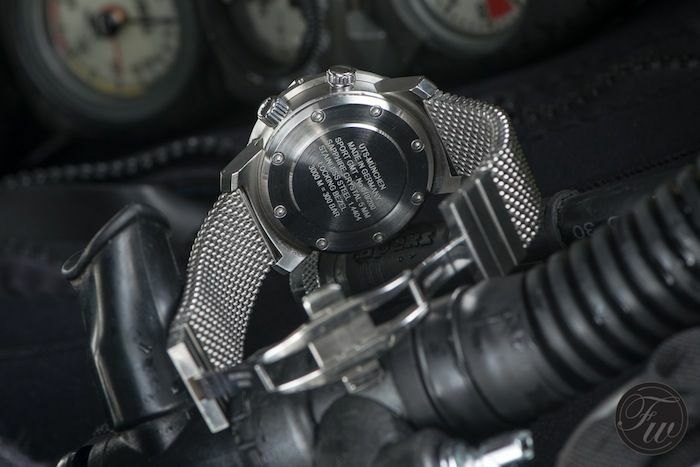 In any case, the pre-owned UTS Diver 3000m we discussed here is being offered for 1750 Euro at Local-Time (click here). If you are interested in buying this watch, mention Fratellowatches to the seller and you will get a 20% discount. More information about UTS München can be found here.